This movie makes you reminisce a lot, to the times when the name Steven Spielberg was synonymous with movies such as Jaws, Jurassic Park, Schindler’s list, Saving Private Ryan, Minority Report, to the times when your hear the name “Steven Spielberg” your mind immediately goes to unique, daring, talented. To see him make a movie like this is a bit difficult to digest. But the movie is based on a children’s novel of the same name, still just because it’s based on a children’s book doesn’t mean it has to be the definition of PG-13, which by the way is really irritating. 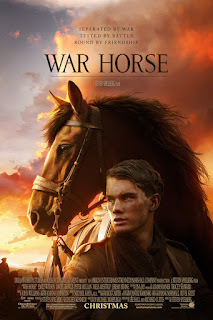 I mean when you hear the name “war horse” it plants a picture of a horse in the middle of a bloody battle field pulling somebody’s dead carcass around but the movie is like Babe with a horse. The cinematography is really good, amazing in fact, the locations are breathtaking, The ironic thing about the location is the horse and it’s owners were living there because they were poor, now a days you have to sell your soul to get to live in a place like that, which I believe is a negative point for the movie. What was so great about this movie? Well, it was definitely not the direction, the cinematography was worth it, but if you ask me, it’s that bond between humans and animals that makes this movie worth watching. We all done it at some point in our life, when we valued the life of an animal more than a human being. I guess it’s their innocence and their undying faithfulness and the fact that they can’t talk back at us makes them the best. The story is about the friendship between a boy and his horse. Albert Narracott (Jeremy Irvine) is a son of a local farmer Ted Narracott (Peter Mullan) one day Ted blows all his money on a horse like everybody else he blames the alcohol. Now Albert despite his dad’s drunk*** decision to buy the horse develops an almost “Oh my god! Call the SPCA” relationship with his horse. Their friendship grows scene by scene until his dad decides to sell the horse to the army for money to feed his family. The story kind of wanders around a bit after this part, probably the writer ate the wrong kind of brownies. The story get very “Disney” in these parts, you know where the birds come flying in to help you make your breakfast, it was almost like the horse couldn’t be killed. Hopefully no kid wanders around into an active war zone hoping to be like Joey (the horse), PG-13? my hairy ***, anyways, the rest of the movie shows how Joey and Albert reunite. There are a lot of unwanted scenes in the movie, like people speaking in French and German accents rather than speaking French and German! wow, I hate Avatar, but at least they made those overgrown Smurfs talk in that stupid language. I guess that’s what happens when your aim is to make money, but have to admit, this is a good movie for your kids to watch and adults to sneak in some alcohol. But seriously, take your kids if you have any or your nieces and nephews under 13 to watch this movie.